Previously posted items for sale have been moved to the USCA Facebook Group. You are welcome to post your own item for sale or wanted on the community supported USCA Facebook Group. High Fidelity Dynamic Microphone for Concertinas, Accordions and Bandoneons. Greatly enhance the amplified sound of your concertina with a dynamic microphone. Many concertina manufacturers and technicians install this internal microphone in concertinas for professional and novice musicians as well as for the weekend hobbyist. This modern microphone design eliminates the squeak and squawk that exists with many of the old fashioned crystal microphones. 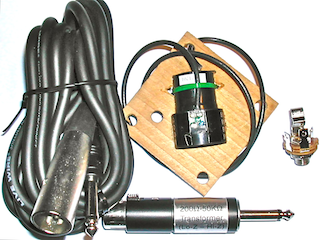 Once installed, this microphone plugs directly into an XLR (three pin) amplifier input, or simply use the included impedance matching transformer and plug into an amplifier with a 1/4 inch (TS) mono input. 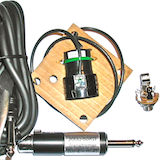 With this package you can plug your instrument into just about any type of amplifier or mixing board. These high quality dynamic microphones feature a cardioid (uni-directional) polar pattern; a frequency response from 80 Hz to 12,000 Hz; an output impedance of 600 ohms (+/- 30 percent) at 1,000 Hz; and a sensitivity of -72 dB (+/- 3 dB). Complete instructions are included with each microphone. Installation requires the use of simple hand tools and a soldering iron. Contact information for free support from a professional technician is provided to each Buyer. The complete package of a high fidelity dynamic microphone, internal 1/4 inch jack, durable 10-foot long cable with 1/4 inch (TS) and XLR connectors, and an impedance matching transformer (XLR to 1/4 inch adaptor) is only $92.00. Shipping and handling are free for destinations within the United States. If you already have the necessary XLR connector, XLR cable and impedance matching transformer, you can purchase the dynamic microphone alone for $60.00. Shipping and handling is free for destinations within the United States. Please note that this microphone will not operate correctly using the 1/4 inch high-impedance amplifier input. You must use the XLR low-impedance input, or the impedance matching transformer that is included with the purchase of the Microphone Kit. For more information or to place an order, please contact Ted at tedns(at)tds(dot)net or 715.498.6204. Isn’t it time that you replaced those old and worn hand straps on your concertina? Don’t risk damaging that expensive instrument or breaking one of those old straps during your next performance. These great-looking hand straps are made from high-quality cowhide, padded with real sheep’s wool and use nickel-plated metal buckles and snaps. The design, patterns, and tooling originated with those straps made for and used by Star Concertina for decades. These are the same straps that are now used by several manufacturers on their new concertinas. Each strap is sized correctly for use on a standard-sized triple and quadruple reed chemnitzer concertinas and bandoneons. This is a sturdy strap, dyed black with contrasting white stitching and white wool padding. All of the hand straps are made of brand-new materials by a highly-skilled craftsman. They are individually inspected to ensure your complete satisfaction. With proper care, they will last for many years of normal use. $50.00 per pair, which includes all shipping and handling for destinations within the United States. $55.00 per pair for destinations in Canada, and $60.00 for all other locations. Considering their superior quality and sharp looks, these straps are a real value. These hand straps are handmade by Paul Ziegler of Mankato, Minnesota. Quick delivery upon receipt of payment. For more information or to place an order, please contact Paul at zake(at)hickorytech(dot)net or 507.340.6498. 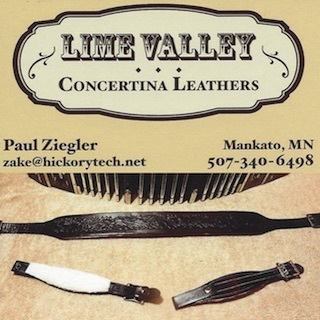 Seller offers custom made leather hand straps designed especially for use with a chemnitzer concertina. These are the same hand straps that are being used by several professional concertina musicians in the Upper Midwest. The hand straps are offered in four styles with a black, white, or brown finish. Rhinestones are available in seven different colors. Prices range from $49 to $100. 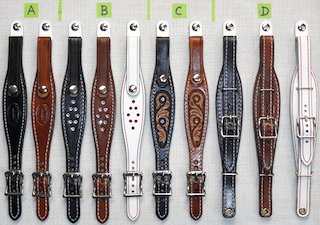 These hand straps are handmade by John Albiniak of Phillips, Wisconsin; master leather crafter since 1951. Delivery time is dependent upon current orders. For more information or a full-color brochure, please contact John at jlal(at)pctcnet(dot)net. 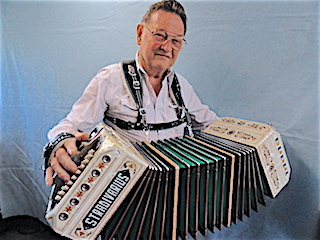 Seller offers custom made leather shoulder harnesses designed especially for use with a chemnitzer concertina. This is a brand new alternative to the standard neck strap, taking many months of thoughtful development. 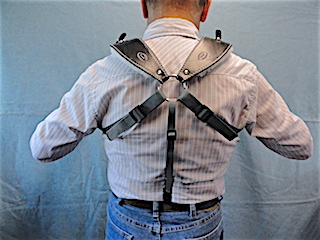 The design of the harness moves the weight of the instrument to the shoulders and relieves your neck and spine from unnecessary pressure and strain. This is the same shoulder harness that is now being used by several professional concertina musicians in the Upper Midwest. The harness is available in either black or brown finish. It is constructed of 8 ounce cowhide with 1/2 inch thick sheep wool shoulder pads filled with 3/8 inch of additional foam cushioning. Check out these videos to see the harness in action. Prices available upon request. These harnesses are hand-made one at a time by John Albiniak of Phillips, Wisconsin; master leather crafter since 1951. Delivery time is dependent upon current orders. USConcertina.com is not responsible for the accuracy of the information published in these ads. USConcertina.com is not liable for any part of the financial transaction associated with the product or service offered and is not responsible for mediating transaction disputes.